What a week, a broken fridge, an ancient car in need of repairs to pass inspection, fraudulent charges on our credit card and at the end a wonderful new cake. Maybe the week wasn't so bad after all. Well, you can be the judge. At this point I could relate details of my week, the path I had to clear through my house for the fridge to be delivered. The four and a half hours I spent waiting for the fridge to be delivered willing the path to stay clear rather then returning to its natural state of clutter. I could also rant about the fraudulent charges, from my husband's card to an online dating service, in New Zealand. Aside from being puzzled at using a stolen card number for such a traceable thing there was the response when I called Yahoo Personals, the umbrella company for the New Zealand dating service, who wanted to know my yahoo ID number, the name of my favorite uncle, where I spent my summers as a child, address, alternate e-mail address.... Hello! The charges are fraudulent, therefore I don't have an account with you nor do I know any of the security info for this account. But this cake is much more interesting then all of that. I have been dreaming of making this cake since I first read the recipe in April. It is from Molly Wizenberg's book, A Homemade Life: Stories and Recipes from my Kitchen Table, that I received for my birthday. Once I read the recipe all I had to do was wait until blueberries and raspberries were both in season. I had a hard time finding the kirsch called for in the recipe, but based on David Lebovitz's recent blog post on it I realized it was not an ingredient I should leave out. It really is integral to the cakes depth of flavor, what makes it more then just a pound cake. 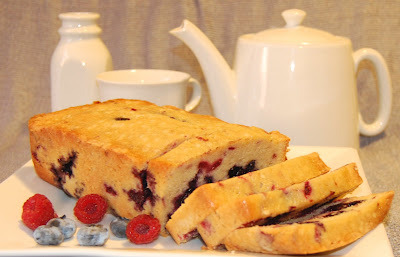 As I have previously mentioned I sometimes make cakes to bring in to work and from the start I planned to make this cake for work, when both berries were in season. A normal person would have bought the fruit from the store and baked the cake during the day. However I have been told that normal is not the first word that pops into peoples heads when asked to describe me. So my boys and I went berry picking with friends and I baked this cake when they went to bed. We delivered the cake to work, took a slice each, accepted compliments on the cake and then left. The one slice I had was not enough and that afternoon I baked the cake again for us. Molly states on her blog that this cake freezes well, so I made it in two loaf pans. We ate one, faster then I would like, and the second one I froze for the winter. The version for work I made with all purpose flour, the one for us I used half all purpose flour and half white whole wheat flour. (my favorite whole wheat pastry flour is sold out until the farmer harvests more in October, the downside to buying local). With all that whole wheat goodness, the berries and the eggs we decided this makes a fine breakfast. I mixed mine up in the stand mixer instead of the food processor that Molly uses. I have a food processor but it has a crack in the bowl, it still works fine for pesto and grating cheese, batters are out though. Other then that and the use of half all purpose flour and half white whole wheat flour for the cake flour, my only change was in technique. I add the baking powder and salt before adding the flour. I almost always mix cakes and muffins this way, you can make sure any dry ingredients other then flour are well incorporated without worrying about over mixing the flour and forming gluten. This means for other recipes I just ignore the step that calls for combining the dry ingredients in a separate bowl before adding. I add everything but the flour, mix well and then add the flour. Toss the raspberries and blueberries in a large bowl with 2 Tbsp all purpose flour before using a spatula to fold them into the batter. Scrape the batter into the prepared pan or pans and smooth the top. Place in the center of a cold oven and turn the oven temperature to 300°. Bake until a knife or cake tester inserted in the center comes out clean. For both pans for me this took 1 hour and 25 minutes. Cool in the pan or pans for 5 minutes before inverting on to a cooling rack to cool completely. If you wish to freeze the cake wait until it is cooled completely and then wrap tightly in plastic wrap, then place the wrapped cake in a freezer bag. Hey Robin! Just found this recipe and promptly made a batch for breakfast today - just lovely! Thanks for sharing! I had some kirsch I bought from an organic cherry farm from Switzerland - it was perfect! Yum!